Last Tuesday, Israelis woke up to a new political reality. 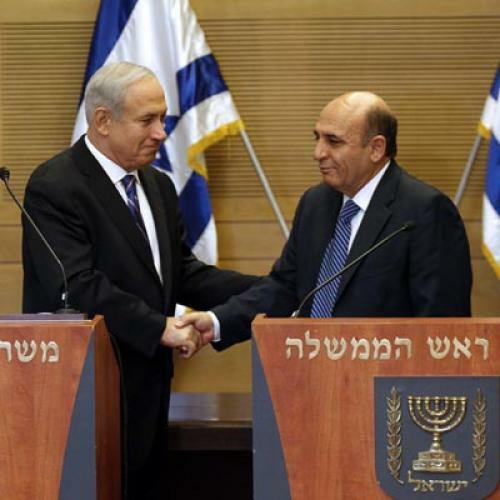 In the middle of the night, as the Knesset was voting to enact an early general election, Prime Minister Binyamin Netanyahu announced a surprising deal with Shaul Mofaz, the recently elected leader of the main opposition party. All of a sudden, the snap election was called off and Mofaz’s Kadima party was part of the governing coalition. The deal was essentially about self-serving domestic politics; all the main actors (Netanyahu, Mofaz, and defense minister Ehud Barak) reaped rewards from the arrangement. But it also clearly strengthened Netanyahu's foreign policy hand. With 94 out of 120 Knesset members in his coalition, with the opposition shredded and powerless, and with the smaller coalition parties unable to forestall a parliamentary majority, Netanyahu can theoretically pursue whatever national security strategy he pleases. He can go to war against Iran, or avoid going to war, or make peace with the Palestinians, or expand the West Bank settlements. The most likely result, however, is that the new coalition will first move towards a heightened confrontation with President Obama. Netanyahu’s relationship with Obama revolves around two issues: Iran and the West Bank. Netanyahu would like to see Iran's nuclear facilities destroyed and the West Bank settlements grow. Obama wants to curb Iran's nuclear program peacefully, and do away with the settlements. In the past three years, they failed to reach a deal on “Natanz for Itamar,” under which the United States would bomb Iran and Israel would remove the thorniest settlements in areas slated for a viable Palestinian state. Instead, a kind of balance of terror evolved. Netanyahu did away with the settlement freeze imposed by Obama, while also heeding Obama’s call to avoid hitting Iran. With President Obama running for re-election, the two leaders were probably fated to soon find themselves in a showdown in any case. A reelected Obama will probably return to his pet issue, Palestinian independence, and apply stronger pressure on Netanyahu to curb settlement expansion. But in the absence of assurances from Washington, Netanyahu will be tempted to act upon his “second Holocaust” warnings and attack Iran unilaterally, without American consent. His bolstered domestic political leverage has only made that prospect seem more attractive. Can Mofaz save Netanyahu from pursuing that kind of dangerous confrontation with Washington? On paper, Kadima, with its 28 MKs, could push Netanyahu toward a staged two-state solution, which Mofaz proposed in detail a couple of years ago. Moreover, Mofaz, the former military chief of staff and defense minister, has publicly opposed an Israeli attack on Iran. His presence in the Cabinet could therefore strengthen the moderates and prevent a risky airstrike. Mofaz has no ideology, but unlike Netanyahu or Barak, he is not an intellectual snob, and relies on thorough preparation and staff work. So it’s tempting to think of him as a sober head in the top decision-making echelon, someone who can tone down the alleged warmongers Bibi and Barak. The reality is he probably can’t. In the Israeli system, the prime minister enjoys ultimate power over foreign policy. He can be curbed, or influenced, only by strong challengers from within or outside his party, who enjoy sufficient clout to threaten his survival and reelection. That's why these challengers are usually exiled to the foreign ministry or the defense ministry, where their power can be held in check by the prime minister and his cronies. This is how Israeli governments have functioned since 1948, and the incumbent one is no exception. Netanyahu gave the foreign ministry to his nemesis, Avigdor Lieberman, while relying on Barak at defense to neutralize Lieberman. But the logic of that stalemate works both ways; any time the defense minister has tried to convince Netanyahu to take a less hawkish stance towards the peace process and the settlements, his efforts were thwarted by Lieberman and Likud far-rightists. In any case, when it comes to Iran, Barak is now just as hawkish as Netanyahu. Mofaz strengthens the moderate camp, but just like Barak, he is simply not strong enough to challenge Netanyahu on policy. Having not even been given a ministry to call his own, Mofaz's only option to influence foreign policy is by leveraging public opinion. But since he hardly has any popular following, he has hardly any hope at all of challenging Netanyahu’s popularity or political command. Israeli unity governments usually start with high hopes, but one of the partners always comes away aggrieved. The current one will probably be no exception, with Mofaz the most likely one to end up as spurned lover. So Netanyahu will keep calling the shots and preparing for a post-November duel with Obama—one in which he knows he can’t any longer be portrayed in the domestic or international press as a patsy of the settlers and their Likud supporters. Indeed, Netanyahu’s supporters are already arguing that with Mofaz on board, the government can now present a unified front in advocating for a war against Iran. But talking points aside, Mofaz has bought Netanyahu precious time and given him considerable power for a very low price. The prime minister can now stand up to Obama, if he wishes, supported by a wide majority and lacking a credible opposition. If Obama is reelected and again directs his attention to Middle East diplomacy, Netanyahu will not only be ready—he will be stronger than ever before. Aluf Benn is the editor-in-chief of Haaretz.